"I hold Director Comey in the absolute highest regard. 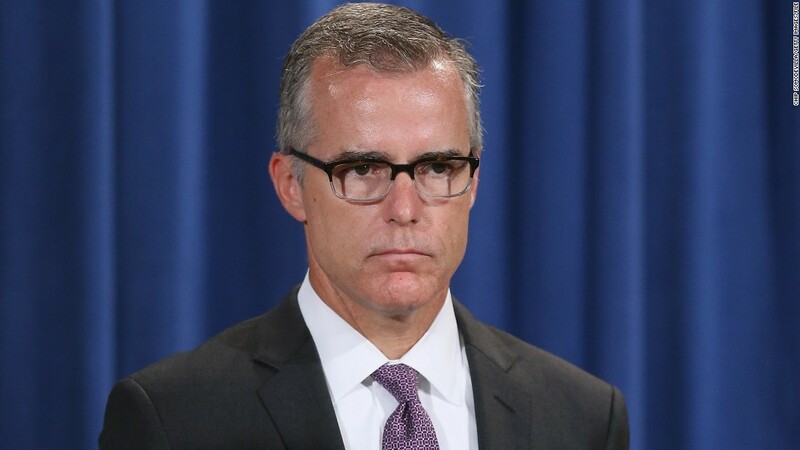 I have the highest respect for his considerable abilities and his integrity," McCabe told members of the Senate intelligence committee. He said Comey, who was fired by President Donald Trump on Tuesday, enjoyed "broad support within the FBI and still does to this day." He added, "The majority, the vast majority of FBI employees enjoyed a deep, positive connection to Director Comey." On Wednesday, Sarah Huckabee Sanders, a White House spokeswoman, said the President "and the rest of the FBI" had lost confidence in Comey. She said the White House had heard from "countless" members of the FBI to that effect. McCabe also contradicted another statement by Sanders in Wednesday's White House briefing when she said that the Russia investigation was "probably one of the smallest things" on the FBI's plate. "We consider it to be a highly significant investigation," McCabe said, but declined to give details of the manpower involved in the probe. The acting FBI director also said there has been no effort to impede the FBI's investigation into Russian interference in the election, but vowed to inform a Senate panel if the White House tried to intervene. McCabe testified on Capitol Hill amid reports that Trump had dismissed Comey partly because he was infuriated about the bureau's probe into whether his campaign aides colluded with Moscow. He said nothing could prevent the FBI from "doing the right thing" but promised to tell the Senate intelligence committee if any attempt was made to thwart the investigation. Amid reports that Comey had asked for more resources for the Russian investigation, McCabe testified that he believed the bureau had adequate resources to complete the job. He was asked by Republican Sen. Marco Rubio whether the dismissal of Comey had "in any way impeded, interrupted, stopped or negatively impacted" the investigation. "As you know, senator, the work of the men and women of the FBI continues despite any changes in circumstance, any decisions, so there has been no effort to impede our investigation to date," McCabe told members of the Senate intelligence committee. "Simply put, sir, you cannot stop the men and women of the FBI from doing the right thing, protecting the American people and upholding the Constitution." In an earlier question from ranking Democrat Mark Warner, he vowed "absolutely" to inform the committee if Trump's White house did take steps to interfere. McCabe's testimony overshadowed the testimony of other witnesses on issues including the state of the war in Afghanistan and North Korea's nuclear confrontation. Burr, a North Carolina Republican, had opened proceedings by asking the panel's members to focus on the original topic of the hearing -- discussing "World Wide Threats" -- a request Warner said would be difficult to accommodate. "It is impossible to ignore that one of the leaders of the intelligence community is not here with us today," the Virginia senator said in his opening remarks. "The President's firing of FBI Director Comey Tuesday night was a shocking development. The timing of Director Comey's dismissal to me and to many members of the committee on both sides of the aisle is especially troubling." McCabe took part in a private meeting with Trump at the White House on Wednesday, after deputy White House spokesman Sarah Huckabee Sanders said that the President would talk to him about morale at the bureau following Comey's departure. Burr has also expressed concern about Comey's firing. "I am troubled by the timing and reasoning of Director Comey's termination," Burr tweeted. "His dismissal further confuses an already difficult investigation by the Committee." Alongside McCabe at the witness table were Director of National Intelligence Daniel Coats, CIA Director Mike Pompeo, Admiral Michael Rogers, who heads the National Security Agency, Lieutenant General Vincent Stewart, Director of the Defense Intelligence Agency and Robert Cardillo, who runs the National Geospatial-Intelligence Agency. --Execution Time: 4/18/2019 6:14:17 PM - 4/18/2019 6:14:17 PM = 0.0780649 sec.